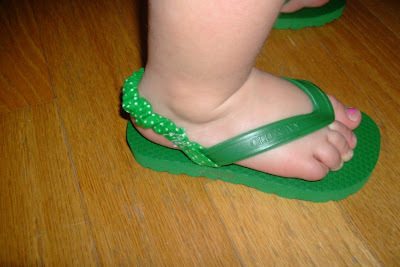 I got these little flip-flops at Old Navy's $1 sale last year, and they now fit my toddler. The only problem was that they didn't stay on. 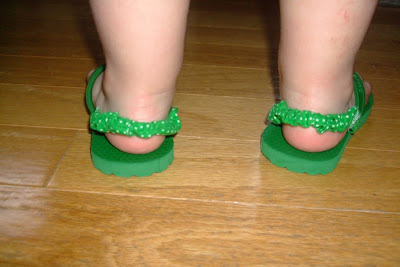 She is not accustomed to wearing flip-flops, and they flopped right off her pudgy feet. I have seen ones in the store with elastic around the heel to keep them on and figured I could do that myself. I made a fabric casing (a long tube) and pulled some elastic through, then sewed it on. It was a little hard to wedge the flip-flop strap under my sewing machine needle, but I got it. It's not the neatest job, but it'll do. I'm sure she'll grow out of them in a few months anyway. I love this idea. My girls love to wear flip flops. I just might have to do this for them or at least Ava.